The Miami Olympic Classes Regatta is the most important regatta annually for American Olympic aspirants. It is one of the first World Cup ranking regattas on the circuit, and it is also a chance for teams and individual sailors to get a spot on the US Sailing Team. Not only did I again earn my #1 spot on the team, but I also had the best regatta of my life. Miami is never a predictable place for racing. For the past two years, it has been a light-wind venue, but this year we had more wind than normal and even one day of planing races. The week saw a full, fairly classic frontal rotation of the wind from east to northwest, with a different direction every day. 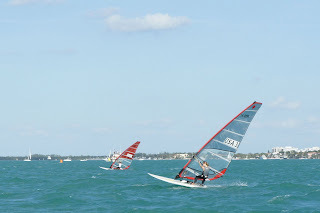 The one constant of Miami racing is that the wind will always be shifty and puffy, and there will always be weeds (shedding Florida seagrass and algae) to drag around the course on your fin. The first few days of racing passed easily, as the wind direction was easterly, giving us cleaner and stronger wind. The second day of racing saw planing conditions in a southeast 15 knot breeze. We easily managed two races in warm, cloudy, fast conditions. I had good starts and since my pointing is a lot better, I had some good finishes. However, the third day proved to be the toughest of the regatta. Any easterly direction pushes a lot of weeds onto the course, so that by the third day, the weeds were floating around in huge lines, ready to trap sailors. The wind was a shifty, very gusty southwest as cloud lines marking the beginning of a front rolled through. These conditions are very difficult because sailors must be very good at transitions, tactics, and making minute adjustments to technique in every gust or lull. My first race was the best of the series, but my second race was the worst. As the breeze died, the weeds and general Miami debris became more and more of a menace to being able to plane. Every sailor had to clear weeds several times during the racing. My Canadian friend, Dominique Vallee, had a piece of cardboard get stuck in her daggerboard well; she had to stop to physically jump in and pull it out so she could put the board up. I tacked going downwind rather than jibing - it was still faster than dragging weeds! I've never sailed anywhere else in the world that has as many obstacles in the water. The wind failed to materialize on the fourth day, and after a long wait on the water, we went in without racing. The front finally filled in for the fifth and last day of racing. We again had two races in puffy, dying northwest frontal breeze coming down from the cityfront. Racing was a little tougher for me today as I was nervous going into the first start, fouled someone, and fell trying to do my penalty turn. I played catch-up for the rest of the race, and was actually pleased with the finish. The long courses and dying breeze of the regatta's final days made for some really long and difficult racing. I'm really excited about what a 12th place finish in a fairly competitive fleet means. I know the results have come from finally developing the techniques that have frustrated me for years, with the help of consistent coaching from Britt Viehman for the past month. I have been really aggressive about learning skills step by step, and creating lists of short goals. I now have a new list of skills to develop, and am looking forward to February's plan, and March's training and racing in Europe. It will once again be a tough fight to get the resources together to make a comprehensive plan. However, I've already proven that I have unlimited quantities of willpower and fight for the final push to the Olympic qualifier regattas, and much more. I want to thank my sponsor, Compass Marketing, for making this effort achievable. Compass has shown unwavering support of my Olympic campaign since 2008. Already the biggest regatta of the winter season is upon us. 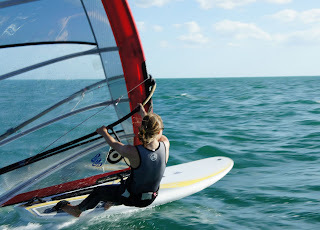 Today was the first day of the Miami Olympic Classes Regatta, the qualifier for the 2011 US Sailing Team. There are 29 girls registered in the RS:X fleet, the biggest in three years. In attendance are some of the best sailors from Spain (Marina Alabau and Blanca Manchon; both have European and World titles), Great Britain (Bryony Shaw, 2008 Silver medalist), and the French national team. Also competing are some excellent sailors from Canada, Mexico, Brazil, and Argentina. Britt Viehman is again coaching me. Over the past month, I've made a detailed, day-by-day plan that has included some of his youth team training camps, several days of private coaching, and lots of video. The coaching has helped immensely, especially the video, and this winter's endeavors are beginning to pay off. My focus for this regatta is to incorporate the new techniques I've learned in an actual World Cup regatta, and emphasize executing each component of a race. Execution met with success today in a fine opening day's 12-14 knots of breeze. The first race exemplified my day. I had a clean start, but got rolled by a couple fast girls going low. I had to tack out, but got out into clear air, good pressure and hit the port-tack layline railing fast. I rounded in 10th and maintained the position until the last downwind, when I got passed by one sailor. I finished 11th, one of my best finishes ever in a fleet this size. The Alex Caviglia Bluewater Classic is a regatta held annually at Shake-A-Leg Miami, a well-known and organized facility focused on providing access to sailing and the water to disabled folks and less-advantaged community members. The proceeds benefit the Caviglia Bluewater Foundation, which assists the families of victims of traumatic brain injury using sailing as a medium. The Caviglia regatta is attended annually by international RS:X sailors training for the Miami OCR. For the past two years, I sailed Formula at this regatta, but in preparation for the critical 2011 season, I used the regatta as a test to see how well my newly acquired light wind technique held up against some of the world's best women's RS:X sailors, including the British silver medalist and Spanish world champion. The focus of the regatta was reinforcing the skills I learned over the past month in a competitive setting. My goal was to break down each race and apply the new pumping and pointing techniques as much as possible and treat the regatta as a training camp. We had light and marginal wind for all three days of the event, conditions normally seen also at the OCR. I was really pleased at the way I am now keeping up better with the faster sailors in the lighter conditions. I'm definitely more in the game than I've ever been, and I'm happy with the results of the hard work I've put in over the last months. With only about seven or eight days of coaching, I've been able to correct things that have frustrated me for years, and I'm looking forward to applying my new experience at the OCR. I'm really pleased to announce that I'm now a part of the "Clever Pig Sailing Team," a group of sailors who have been awarded grants by the Southport Sailing Foundation (SSF). The SSF is an enthusiastic and active non-profit organization dedicated to helping youth and young adult sailors achieve their competitive sailing goals. They also aim to help these sailors put together more professional campaigns through their website, into which they have put considerable effort. The Clever Pig Sailing Team includes Rachel Bryer (Laser Radial), Jennifer French and Jean-Paul Creignou (SKUD), Kyle Larsen (Laser 4.7); Sarah Lihan, a Laser Radial sailor on the US Sailing Team, and myself. I am very happy to be the recipient of the SSF's grant. I feel that the foundation has genuine and passionate members who are eager to do what they can to promote competitive sailing. Their quick response and readiness to give advice, help, and promotion to interested sailors signifies commitment to their cause and a true team approach, which is very refreshing. I am proud to represent this wholesome group and will endeavor to do my best to be an ideal ambassador. Life is progressing fairly smoothly here in south Florida, and I've been doing my best to create a good training schedule. I decided to stay local once again to conserve money for the spring European season, which means my resources are now going to new equipment and coaching in preparation for the Miami Olympic Classes Regatta (OCR). This important regatta determines 2011 US Sailing Team rankings and is the focus of all my resources this month. My goal this month is to obtain as much focused training as possible, with coaching and video. 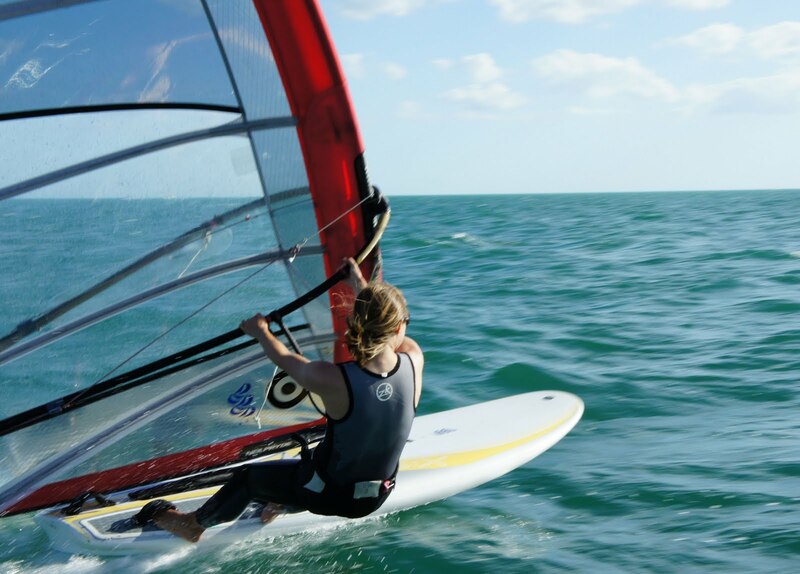 I am accomplishing this by working with the developmental group of windsurfers as much as possible, under the guidance of Britt Viehman, their coach and friend of mine from St. Petersburg, FL. I attended two of the development camps in Miami and Cocoa Beach, FL, and am also working with Britt individually in Miami leading up to the OCR. Having focused goals means that I selected just a few aspects of my sailing to improve. In this case, using Britt means I can work on the most "developmental" and basic part of my sailing: pointing upwind in light wind. This seems very basic, but for me, because of too many variations in instruction or having no instruction at all, I have always struggled with light wind concepts. "Pointing upwind" also includes work on pumping, acceleration, steering, and other more minute details. We are making good progress, and slowly eliminating one of the weakest areas of my sailing. I am happy that I can finally begin to put my fitness to good use, and I'm looking forward to finally out-pumping my competitors at the Miami OCR.